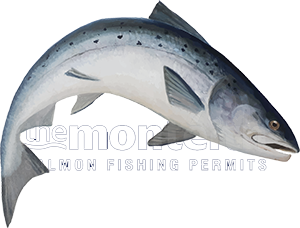 This is the time of the salmon fishing season where switching into careful stealth mode will be the different between success and a blank. In Scottish salmon fishing tactical astuteness often represents a game of opposites. Success in salmon fishing has nothing necessarily to do with expensive fishing kit or being out on the best available salmon beats but much more to do with adapting your fishing approach to match the water conditions. It always amazes me how salmon anglers often keep going with biggish size 9 Spring flies right into June and beyond instead of switching down to the much smaller sizes that salmon are far more likely to take an interest in during the low clear warm water conditions of Summer. On the beautiful River Dee the low warm water of Summer key to success requires the use of the lightest dressed size 16's & 18's for salmon to be interested. Clearly these salmon have switched back into their 'juvenile' mind set for these tiny salmon flies to be of interest and fishing with anything bigger is usually a complete waste of time. These tiny River Dee salmon flies are seldom used on the River Tay from what I've seen and anglers keep going with the bigger largely 'ignored' flies. Having independent thoughts works in salmon fishing so it's best that you break from the pack and experiment when the normal sized salmon flies are being completely ignored. The low water levels or Summer often creates confusion in a salmon fishers mind so let me explain what I'll mean. In high water conditions the water pressure of the river in many cases pushes salmon into the river margins where they can get a break from the current and a short line is the order of the day. In the low water Summer conditions (and lower water pressures) the salmon lies are much more likely to be out nearer the centre of the river in the deeper pockets so a longer line is the order of the day. Presenting a fly line at longer range is normally more appropriate through the lower water Summer months than during the higher water levels of Spring or Autumn when salmon are usually holding much closer to the riverbanks. With the above in mind here's the big error that is often made by Summer fly fishers. Those low water Summer conditions usually encourage anglers to test out their deep wading skills which will highly unlikely go unnoticed by the underworld! The key to low water Summer fishing is giving the salmon lies due respect and keeping well back and fishing a long line to cover them. This approach works far better and the only thing the salmon are aware of is your fly! Salmon pools can easily be completely trashed by Summer salmon fishers who are convinced getting as close to the fish is the answer or who haven't taken the time to learn how to 'load' their fly rod properly! If you're fishing the correct small size of proven salmon fly pattern paired up with keeping well back from suspected salmon lies then you'll be definitely in with the chance of a fish. On the other hand if you're fishing a big average dressed regular size 9 or even an 11 paired with a deep wade through the pool you'll very likely be wasting your time (and the pool) when salmon are reliving their juvenile years! The tiny salmon flies I'd recommend through these low water months would be some of the 'tiniest' and lightly dressed red or black 'Francis' patterns and have the faith to stick with them as a salmon will always find time to snap at a fresh water shrimp simulator!